William Henry Holmes (1846 – 1933) was an American anthropologist, archaeologist, geologist and museum director. His work evidences an impressive combination of art and science. The artwork he created remain not only as items of beauty but also provide great insight into the nature of the American West, including its people. Holmes was from the beginning an artist. His love for art and his appreciation of the aesthetic aspects of all things, whether in nature or man-made, remained a hallmark of his work. His knowledge of geology, archaeology, anthropology, and ethnology added masterful scientific documentation to his landscape paintings, while his anthropological work greatly benefited from his artistic knowledge and talents. In addition to these areas, he also made significant contributions to museology in his time as museum curator in several institutions, an area which perfectly combined his artistic and scientific interests. Holmes lived in the era when American archaeology was neither scientific nor academic, and the Western frontier was an exciting and novel place to explore. Holmes' talents as both artist and scientist led him to pioneer a more scientific and professional approach to archaeology while maintaining a sense of wonder at the beauty of all that he discovered. As time, and the effects of opening the area to often over-zealous investigation, has led to the loss of much of what Holmes was able to see directly, his artworks and writings remain an invaluable record for future generations. William Henry Holmes was born in Harrison County, Ohio, on December 1, 1846. As a small child Holmes developed a passion for art when he discovered he had a genuine talent. His father, a farmer, indulged this talent and did not actively discourage it. At the age of eighteen Holmes entered the McNeely Normal School to become a teacher. He recognized that a teaching career was the only viable option if he was to escape a farmer's life. Holmes graduated from McNeely Normal College in 1870 and briefly went into teaching. In 1871 Holmes moved to Washington, DC, to study under the artist Theodore Kaufman. He also spent some time as a student at the Munich Royal Academy in Germany. He began working at the Smithsonian Institute as a sketch artist after a referral by a friend. While working there Holmes met Spencer Baird and Ferdinand Hayden. These men would play a major part in shaping Holmes' scientific career. The Grand Canon at the foot of the Toroweap-Looking East by William Henry Holmes, 1882. Hayden invited Holmes to work as an artist on his 1872 survey of Yellowstone National Park. Once on the survey Holmes worked as a geologist and cartographer as well as sketch artist. He contributed pioneering reports on the terrain and geologic phenomena of Yellowstone, and completed early geological reconnaissance work in Colorado, working with John Wesley Powell. 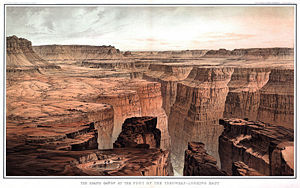 As an artist, he was responsible for illustrative material in an atlas of the Grand Canyon. During these years Holmes traveled widely from the Northern Rockies to the Southwest. After it was absorbed into the U.S. Geological Survey in 1879, he was assigned to work as a geologist in the southwestern United States. In 1875, Holmes began studying the remains of the Anasazi culture in the San Juan River region of Utah. He became particularly interested in prehistoric pottery and shell art, producing published works including Art in Shell of the American Indians (1883) and Pottery of the Ancient Pueblos (1886). He expanded these studies into textiles, and became well known as an expert in both ancient and existing arts produced by Native Americans of the Southwest. Holmes left the Geological Survey in 1889 to become an archaeologist with the Smithsonian Institution's Bureau of American Ethnology. He left Washington temporarily, from 1894 to 1897, to serve as curator of anthropology at the Field Columbian Museum, now the Field Museum of Natural History in Chicago. He returned to the Smithsonian in 1897 to serve as head curator of anthropology at the U.S. National Museum. From 1902 to 1909 he served as Chief (director) of the Bureau of American Ethnology; during this period he studied the Etowah Indian Mounds of the Mississippian culture in Georgia. In 1910, he became chairman of the Division of Anthropology of the U.S. National Museum. In 1920, Holmes became the director of National Gallery of Art (now the Smithsonian American Art Museum), where he assembled exhibits of Indian arts from the Northwest Coast. In 1923, he was awarded the Loubat Prize, a prestigious award for scholarship given every five years by Columbia University, for his Handbook of American Aboriginal Antiquities (1929). He retired from the Smithsonian in 1932 at the age of 86. He died in Royal Oak, Michigan on April 20, 1933. Holmes' career spanned the fields of art, geology, archaeology, anthropology, ethnology, and museology. Throughout, he combined his passion and talent in both art and science in such an authoritative fashion that he has been called a "Renaissance man" (Henson). Holmes began his career drawing specimens for scientists and was soon invited to join the U.S. Geological Survey of the Territories. 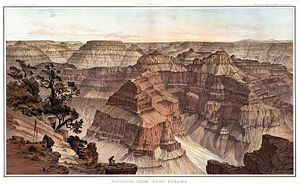 During his years in the western territories, Holmes refined his skills as an artist achieving a reputation for his panoramic landscape paintings of the Grand Canyon. He also produced many delightful watercolors. His paintings that were described as "orgies of pure color" (Henson). A member of the Washington Watercolor Club, he held a number of exhibitions of his paintings at important venues such as the Corcoran Gallery. In addition to his membership in several art societies Holmes was also a member of the Cosmos Club, a social club founded by his colleague John Wesley Powell, which included in its stated goals "the advancement of its members in science, literature, and art" (Cosmos Club), goals which were highly suited to the interests and talents of Holmes. Although hired as a sketch artist by the Geological Survey, Holmes quickly applied and expanded his scientific interest and knowledge, becoming a well respected geologist. His years of study in the western regions, including surveys of the Grand Canyon and other canyons of the Colorado River stimulated his interest in the prehistoric inhabitants. He was particularly interested in prehistoric pottery and shell art. In this way he broadened his interest and expertise into the fields of archaeology and anthropology. He also broadened his geographical area of interest, making a series of field trips to Mexico and other Central American countries, making detailed sketches and panoramic drawings which were included in his numerous publications. Every proper product of the shaping arts is intended for some normal use. In indigenous work, vessels made for use in the domestic arts are suitable to that end; those made for ceremonial purposes are adapted to that end, and are embellished with symbols suitable to their office.... Forms are not interchangeable and embellishments, especially those of an ideographic character, are not used indiscriminately (Smithsonian Expeditions). Holmes combined his expeditions with service to several institutions, including the Smithsonian Institution where he was curator of anthropology (1897-1932) while also serving as curator and director of the emerging National Gallery of Art (1906-1932), now the National Museum of American Art. As a museum director, Holmes utilized his artistic talents to create life-size exhibits, such as the Tehuelche group he prepared in 1892 for the four hundredth anniversary of the arrival of Christopher Columbus. William Henry Holmes was a significant figure in the evolution of American museology and anthropology. He wrote prolifically on archaeological and anthropological subjects, focusing especially on the origins of Native Americans as well as the evolution of "primitive" art. His work in these areas seriously influenced national debate for many years. He also pioneered the use of diorama in museum exhibits. 1885. Evidences of the Antiquity of Man of the Site of the City of Mexico. 1886. Origin and Development of Form and Ornament in Ceramic Art. 1894. Earthenware of Florida: Collection of Clarence B. Moore. 1894. Natural History of Flaked Stone Implements. Schulte Pub. Co.
1895. Archaeological Studies among the Ancient Cities of Mexico. Field Columbian Museum. 1897. Field Columbian Museum Anthropological Series. 1897. Stone Implements of the Potomac-Chesapeake Tidewater Province. Bureau of Ethnology. 1902. Anthropological Studies in California. Government Printing Office. 1903. Aboriginal Pottery of the Eastern United States. Government Printing Office. Cosmos Club Retrieved May 7, 2008. Dutton, Clarence E. 1882. The Tertiary History of the Grand Cañon District. Washington, DC: Bien, Julius & Co.
Henson, Pamela M. "William Henry Holmes (1846-1933) Renaissance Man" Artists at Work: Creativity at the Smithsonian. Smithsonian Institution Archives. Retrieved May 7, 2008. Smithsonian Expeditions. William Henry Holmes Papers, 1870-1931 Retrieved May 7, 2008. Washington Water Color Association Retrieved May 7, 2008. All links retrieved March 4, 2013. Works by William Henry Holmes. Project Gutenberg. History of "William Henry Holmes"